Wow, wow, wow. I absolutely LOVE Taylor and Jason’s wedding. There are so many fun details, it’s just too much to handle. In fact, if you can’t get enough here, you’ll need to proceed to photographer Promise Tangeman’s blog immediately to see even more. I mean it. 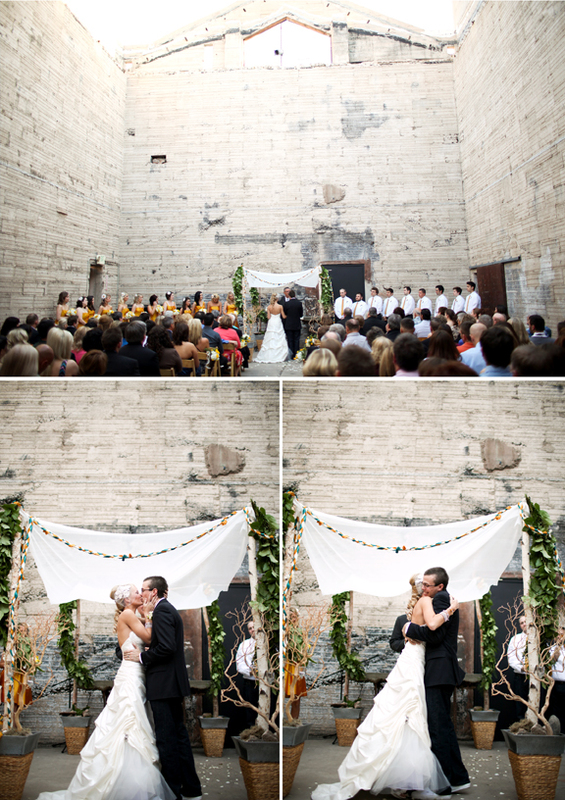 i LOVE the backdrop, those walls! wow. and the details. And we used those birdcages on our tables at our wedding! love them! oh yellow, i canNOT resist your charm. those bridesmaid dresses are wonderful! where are they from? Love this venue,the yellow bridesmaid dresses and the fun vintage inspired props!!! my favorite part of this bridal party? the boys in their bright white sneaks. too cute! Are those two chairs supposed to be Edith and Archie Bunker’s??? wow. love that ceremony site. unreal beautiful! great job, promise! This is the only time that I appreciated the color yellow. They all looks stunning with their dress especially with the boys on yellow tie and white sneaks. Absolutely adorable! 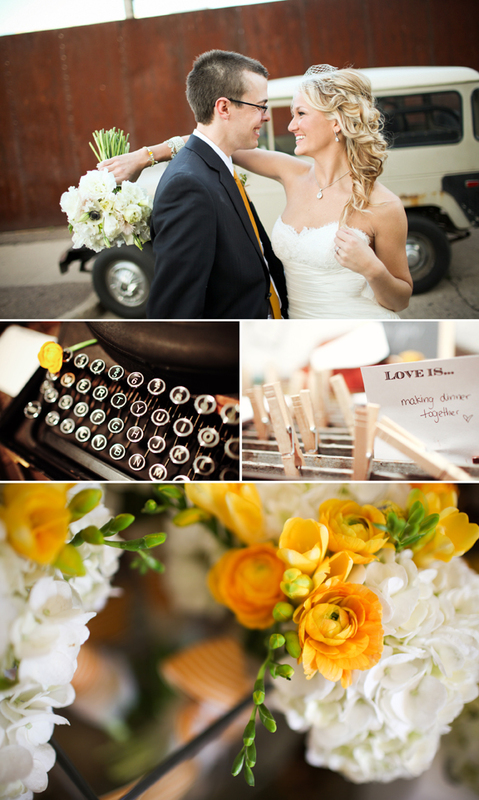 I love the “love is…” touches and yellow is a perfect color to make that venue come alive. There are some fantastic elements to this wedding! I simply love the typewritter and the idea of “what is love to you”. That venue is spectacular! All that brickwork looks awesome. And hearting those yellow bridesmaids dresses. Thanks for the feature… that is really special! Curious how you got the “Greatest of these is Love” words on the ground…advice?! Thanks! LOVE this weeding. The yellow is unexpected, the vintage feel is charming, the location amazing, and the writing on the concrete is fabulous. It looks like cut vinyl, like for signs. Right? Love everything about this wedding. Such a good job and so creative. Couples like this are the best to shoot. I seriously LOVE this wedding. The “Love is” with the typewriter is my favorite. I love your blog Summer!